M-F, approximately every 90 minutes. See the attached timetable and map for stop locations. All rides are a suggested donation of $1. 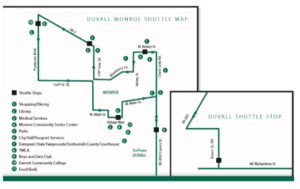 No need to call if you want to take the Duvall-Monroe Shuttle from bus stop to bus stop. When the bus comes, tell the driver where you are heading. Get on the bus and pay your fare (the Duvall-Monroe Shuttle does not accept Orca cards). The driver will announce the stops as they come up.